↑ Wang, S.C., and Dodson, P. (2006). "Estimating the Diversity of Dinosaurs". Proceedings of the National Academy of Sciences USA 103 (37): 13601–13605. Bibcode:2006PNAS..10313601W. doi:10.1073/pnas.0606028103. PMC 1564218. PMID 16954187. ↑ Russell, Dale A. (1995). 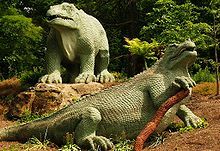 "China and the lost worlds of the dinosaurian era". Historical Biology 10: 3–12. doi:10.1080/10292389509380510. ↑ Amos J (2008-09-17). 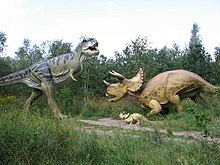 "Will the real dinosaurs stand up?". BBC News. Retrieved 2011-03-23. ↑ MacLeod, N, Rawson, PF, Forey, PL, Banner, FT, Boudagher-Fadel, MK, Bown, PR, Burnett, JA, Chambers, P, Culver, S, Evans, SE, Jeffery, C, Kaminski, MA, Lord, AR, Milner, AC, Milner, AR, Morris, N, Owen, E, Rosen, BR, Smith, AB, Taylor, PD, Urquhart, E & Young, JR (1997). "The Cretaceous–Tertiary biotic transition". Journal of the Geological Society 154 (2): 265–292. doi:10.1144/gsjgs.154.2.0265. ↑ Amiot, R.; Buffetaut, E.; Lécuyer, C.; Wang, X.; Boudad, L.; Ding, Z.; Fourel, F.; Hutt, S.; Martineau, F.; Medeiros, A.; Mo, J.; Simon, L.; Suteethorn, V.; Sweetman, S.; Tong, H.; Zhang, F.; and Zhou, Z. (2010). "Oxygen isotope evidence for semi-aquatic habits among spinosaurid theropods". Geology 38 (2): 139–142. doi:10.1130/G30402.1. ↑ Brusatte, Stephen L. (2012). 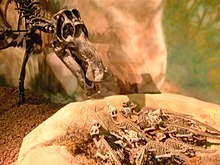 Dinosaur Paleobiology (1. ed.). New York: Wiley, J. pp. 9–20, 21. আইএসবিএন ৯৭৮-০-৪৭০-৬৫৬৫৮-৭. ↑ Nesbitt S.J. (2011). "The early evolution of archosaurs: relationships and the origin of major clades". 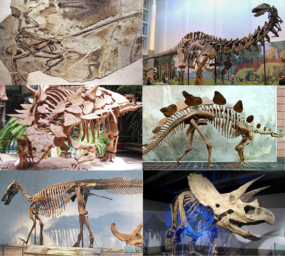 Bulletin of the American Museum of Natural History 352: 1–292. doi:10.1206/352.1. ↑ This was recognized not later than 1909: "Dr. Holland and the Sprawling Sauropods". Archived from the original on 2011-06-12. The arguments and many of the images are also presented in Desmond, A. (1976). Hot Blooded Dinosaurs. DoubleDay. আইএসবিএন ০-৩৮৫-২৭০৬৩-১. ↑ Benton, M.J. (2004). 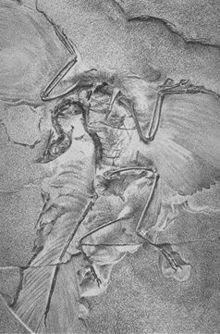 Vertebrate Paleontology. Blackwell Publishers. xii–452. আইএসবিএন ০-৬৩২-০৫৬১৪-২. ↑ Cowen, Richard (2004). "Dinosaurs". History of Life (4th ed.). Blackwell Publishing. pp. 151–175. আইএসবিএন ১-৪০৫১-১৭৫৬-৭. OCLC 53970577. ↑ ক খ Kubo, T.; Benton, Michael J. (2007). 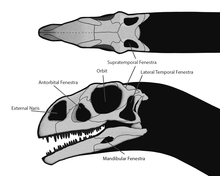 "Evolution of hindlimb posture in archosaurs: limb stresses in extinct vertebrates". Palaeontology 50 (6): 1519–1529. doi:10.1111/j.1475-4983.2007.00723.x. ↑ Nesbitt, S. J., Barrett, P. M., Werning, S., Sidor, C. A., and A. J. Charig. (২০১২). 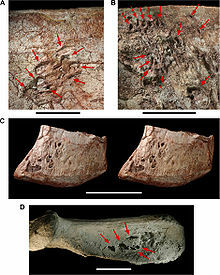 "The oldest dinosaur? A Middle Triassic dinosauriform from Tanzania." Biology Letters. ↑ Godefroit, P., Sinitsa, S., Dhouailly, D., Bolotsky, Y., and Sizov, A. "Feather-like structures and scales in a Jurassic neornithischian dinosaur from Siberia." Program and Abstracts of the 73rd Meeting of the Society of Vertebrate Paleontology ওয়েব্যাক মেশিনে আর্কাইভকৃত ১৯ অক্টোবর ২০১৩ তারিখে, October 2013. ↑ Prieto-Marques, A., Weishampel, D.B., Horner, J.R. (2006). 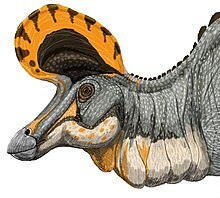 "The dinosaur Hadrosaurus foulkii, from the Campanian of the East Coast of North America, with a reevaluation of the genus". Acta Palaeontologica Polonica, 51 (1): 77–98. ↑ Salgado, L. & Gasparini, Z. (2006). "Reappraisal of an ankylosaurian dinosaur from the Upper Cretaceous of James Ross Island (Antarctica)". Geodiversitas 28 (1): 119–135. স্টার্নবার্গ, সি. এম. (১৯৬৬). কানাডিয়ান ডাইনোসর, Geological Series, no. 54. Second ed. [Ottawa]: National Museum of Canada. 28 p., amply ill.